Me: I should post the turkey sandwich with the cranberry sauce. Everyone will have leftover cranberry sauce to use up. Me: Nope. Too much like Thanksgiving. I'll go with the Southwest sandwich. Me: But cranberry sauce won't be around much longer; habanero Gouda cheese is around all year. Me: No, no. Too much like Thanksgiving. Me: I'm just gonna post both; that way, people can decide for themselves. Jeff: Who are you talking to? 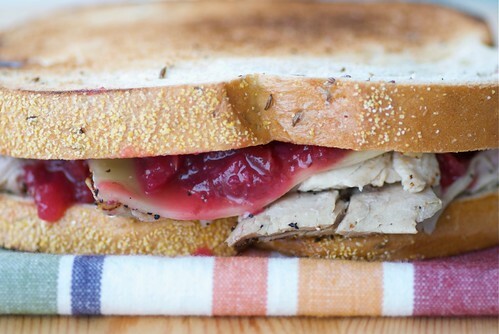 This Turkey, Cranberry, and Gruyere Sandwich with Sage Mustard is all about opposites attracting: toasty, fragrant rye bread and moist, savory turkey; tart cranberry sauce and mild Gruyere cheese; earthy sage and tangy mustard. Somehow, they all come together in perfect harmony. 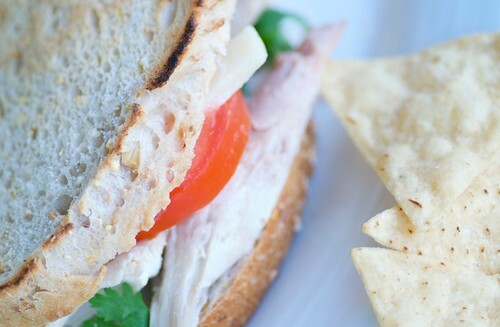 This spicy Southwest Turkey Sandwich was inspired by our recent visit to Winchester Farms. Winchester Farms, which is located about 75 minutes from San Diego, is owned and operated by Jules Wesselink, who was born and raised in Haarlem, Holland. Jules has been operating his own dairies in California since the 1950's, so he knows how to make Gouda cheese. Winchester Farms's Gouda cheese is exceptional. They offer numerous varieties ranging from mild to sharp and include stand-out flavors like garlic Gouda and habanero Gouda. The fiery habanero Gouda is the secret to my Southwest Turkey Sandwich. With its tender texture and bold flavor, you don't need much else to make this sandwich shine. Although I do highly recommend pairing it with some salty tortilla chips and a cold Dos Equis. 1. Lightly toast the bread. Mix the mayo and sage together, and spread on both slices of toast. 2.Heat turkey in a skillet on the stove top for several minutes, until warmed through. Add to the sandwich. Add turkey, cheese, and cranberry sauce. Slice in half, and eat immediately. 1. Lightly toast the bread. Spread both slices with mayo, and top with cilantro. 2. Heat turkey in a skillet on the stove top for several minutes, until warmed through. Add to the sandwich. Top with cheese and tomato. Eat immediately. And Susan ,can i please ask u for a fav???? What a coincidence - my husband just bought some of that habanero Gouda at the farmers market a few weeks ago! We enjoyed it grated in an omelet with leftover christmas ham and bell peppers. Hope you had a great Christmas! Would you believe that my family doesn't eat cranberry sauce? I don't think I've ever seen it at Thanksgiving OR Christmas! But I love fruit spreads with poultry so I may just have to make it for MYSELF. At a non-holiday. Like Thursday? YUM! Both of those sandwiches look awesome! That "too much like Thanksgiving" feeling is the reason I never make turkey for Christmas, but opt instead of a whole tenderloin with my simple blender bearnaise sauce. Seems like we never have ANY beef left over for a sandwich! 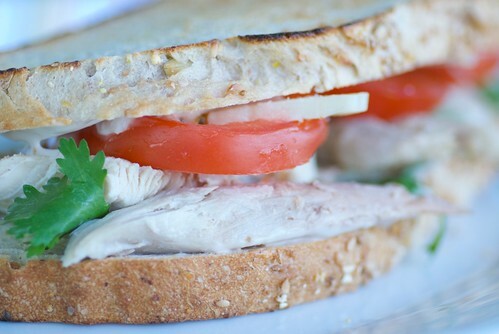 The only reason to have turkey is for to make sandwiches with the leftovers! I'll take one of each! Both sandwiches sound delicious. Best wishes for the New Year. Always glad to find a new recipe that uses Gouda! I have become a recent convert to the joy and creativity of sandwich making. 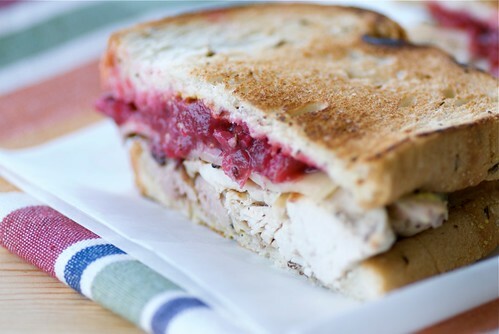 I love of dash of cranberry sauce on a sandwich, and for me, pure heaven is the addition of a little stuffing as well! You bring the best into and out of sandwiches Susan. Both these are seriously good! Love the cranberry sauce! YUM!! rosa-Happy New Year to you as well! vanilla-I'll come check it out. kathy-That is funny! It's amazing, isn't it? abby-No cranberry sauce?! I eat it by the spoonful! michele-My sister-in-law makes a mean beef tenderloin for Xmas Day too! Delicious! ivy-Happy New Year, my friend! tw-I know what you mean; Gouda is underappreciated. I had to re-read the first few lines of the conversation to "get it". :) So funny! These do look yummy! I'd have no problem with having both, maybe even at the same time Susan. Great recipe sandwiches specially with ingredients that we have on hand! Thanks! Wishing you and Jeff a very Happy New Year! I so love the classic first sandwich,...it screams: EAT ME!!! Wishing you a fabulous 2010 ! I'm so glad you posted the cranberry one because that one totally gets my vote. anlai-No leftovers?! Happy New Year! lynn-I love tart cranberry sauce too. johanna-I have never eaten that but would love to try it. Mmmm, I'm liking the sound of the spicy sandwich with the cold Dos Equis... although the sage mayo is soooo tempting!